This travel American Mahjong set features a molded fabric case with zipper for traveling in style! Each resin tile measures 1 1/8" by 7/8" by 1/8" (thinner than normal). 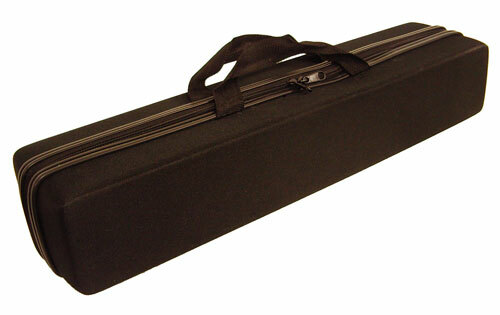 The case holds everything securely for easy travel and measures 19" by 4" by 3". An instruction booklet is included. 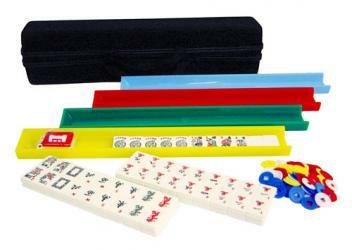 This Mah Jong Vinyl Attache set features a black vinyl case with an easy carry handle. 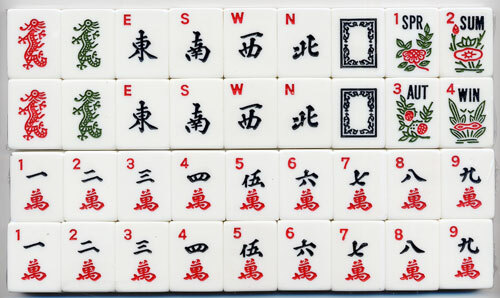 This set is an Asian version and each ivory colored resin tile measures 1 1/8" by 3/4" by 1/2". Tiles, 4 wood racks, money, Black Lizard Vinyl Travel Case 8 3/4", 1 3/16" x 7/8" x 1/8" Tiles. 4 plastic racks, tiles, money. The Tin Case measures 11" x 11" and the tiles 1 1/2" x 1 1/16" x 1/8".